A price boost is when a bookmaker offers higher odds on a sport than normal as a promotion to their customers. The back price they are offering can be higher than the lay price on the exchange meaning you can profit from these price boosts risk free! The amount from price boosts are generally small and around £2-£3 on average, however if you were to do them every day you could easily make £100 or even £150+ a week from just the boosts alone! Do not confuse Price Boosts with "Arbs". Price boosts are promotions that the bookies know they are running. An arb is a price that shouldn't be that high - avoid these! An example may be something like Ladbrokes boosting Arsenal to win at odds of 5.0 instead of 4.0. 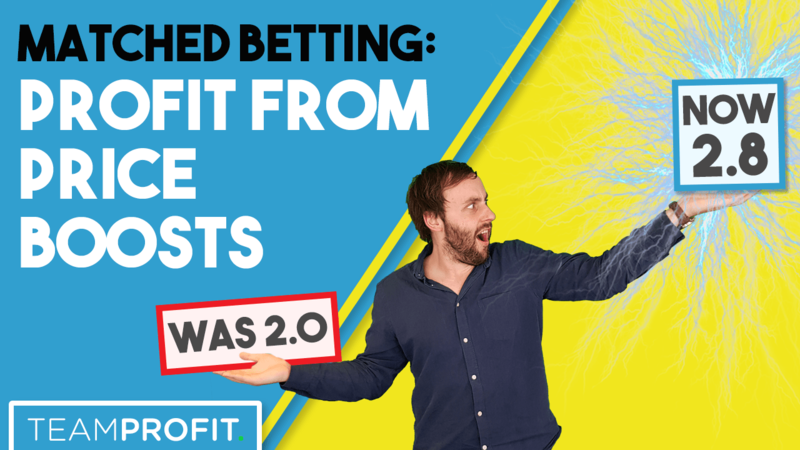 Whenever a bookmaker does such boost, there is always a maximum stake - lets say here it's £20. In this example, the lay odds on the exchange are likely to be around 4.5 which creates us a chance to profit risk free! 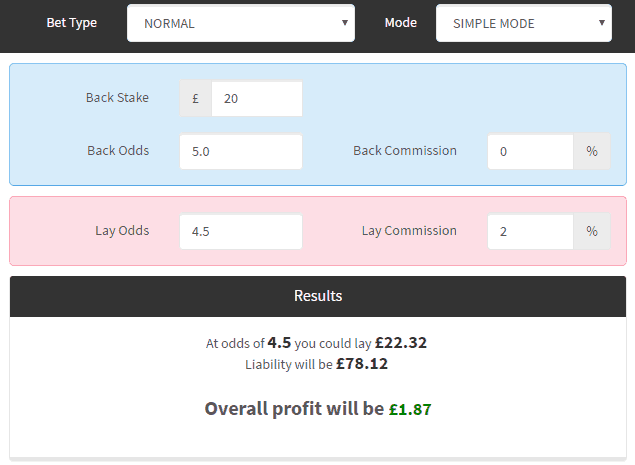 This gives you £1.87 profit, risk free! The profit is worked out just like the loss is on a normal trigger bet. You can see that the lay stake you should place is £22.32 (with a £78.12 liability). This means that if Arsenal win, you win £80 on Ladbrokes but lose £78.12 on the exchange for a net profit of £1.87. If Arsenal do not win, you lose the £20 bet on Ladbrokes, but win your £22.32 lay stake, which after commission is £21.87, so a net profit of £1.87. Always check the max stake of a price boost before depositing into the exchange - you don't want to deposit too much if a boost is say only a max bet of £10! Are All Price Boosts Profitable? Sometimes bookmakers advertise price boosts that aren't actually boosts. The original odds they are offering might be so bad that the "boost" is just bringing the price up to the normal value. Using the example from above, if Ladbrokes had boosted the odds from 4.0 to 4.5, and the lay odds were also 4.5, you wouldn't be able to make a profit and would infact make a loss after paying the commission on the exchange. Not all price boosts have an available lay market on the exchange, and because of this we cannot profit as we can't lay the bet! An example of this is "Ronaldo to score and Messi to score". On Betfair and Smarkets there is a Goalscorer market, but you can only lay one player. The mentioned price boost is for two separate players to score, something which we cannot lay, and so cannot profit from. If you come across a boost like the 2 previously mentioned, simply skip it and move on. There will be plenty of other profitable boosts that you can get stuck in to. Just remember, because it's called a "boost" doesn't always mean it is profitable. 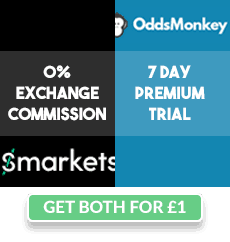 If you have a subscription to Oddsmonkey, you can subscribe to the price boost thread on their community page here. Members post all the best price boosts in this thread, so you can be notified of the profitable price boosts every day instantly. If you haven’t subscribed to Oddsmonkey yet, you can find price boosts manually by going to any bookie’s website. Their price boosts are normally on their home page. If you can’t find any on their home page, it may be worth clicking into a popular football game and see if they have any “match specials” or “price boosts”. In the below example you would have clicked into the Italy vs Uruguay game. Here you can see a Match Special which can be layed off on the exchange for a profit. It's also worth checking Twitter around 45 minutes before a match as boosts are sometimes advertised. For example, in the week when a game starts at 7:45pm, it's worth checking around 7pm/7:15pm as that's when most price boosts are added.